VAE emulsion is the abbreviation of vinyl acetate (VAc) and ethylene (Ethylene) monomer emulsion copolymer, it is used as base material with tackifier, thickener, crosslinker, filler and other VAE emulsion adhesive, no Poisonous, odorless, non-flammable, non-explosive, non-environmental, non-hazardous, and fire-free, it is an environmentally friendly adhesive. VAE emulsion and its adhesives have the advantages of rapid drying speed, good flexibility, high adhesive strength, good water resistance, acid and alkali resistance, oil resistance, abrasion resistance, and aging resistance. At the same time, easy to modify, can further improve performance, expand the scope of application, widely used in non-woven fabrics, electrostatic flocking, PVC film, architectural decoration, carpet backing, paper-plastic composite, product labeling, furniture manufacturing, food packaging, heat Melt encapsulation, delayed adhesives and other fields. VAE emulsion adhesive is an important water-based adhesive that meets the increasingly stringent environmental protection requirements and the adhesive's future development direction. Therefore, it has great prospects for development and broad application prospects. The development of VAE began in the 1930s. In 1938, ICI Corporation issued a patent for VAE high-pressure polymerization with a pressure of 21 MPa and a temperature of 85Â°C. In 1965, U.S. Air Products and Chemicals developed an industrial product, medium pressure polymerization (5 to 15 MPa), which is mainly used as an adhesive. In the 1960s and the 1970s, VAE emulsions developed rapidly and their performance continued to increase. Since 1980s, VAE terpolymer emulsions such as vinyl acetate-ethylene-acrylate, vinyl acetate-ethylene-acrylamide, vinyl acetate-ethylene-maleate, and vinyl acetate-ethylene-unsaturated dibasic acid have been studied. Hydroxylated VAE emulsions were prepared by copolymerization of acrylic acid with vinyl acetate and ethylene to increase the adhesion to metals, provide active sites for cross-linking, and can also be thickened. In recent years, vinyl acetate-ethylene-iso-octyl acrylate-methyl methacrylate sodium tetrapolymers have also been reported. In order to increase the curing speed and adhesive strength, high solid content (65% to 75%) VAE emulsion products have appeared. VAE emulsions are usually prepared by medium pressure emulsion polymerization. The ethylene content is 10% to 40%, usually 14% to 18%. With different protective colloids, the structure and properties of the emulsion are different. The VAE emulsion obtained by using polyvinyl alcohol as a protective adhesive has excellent viscosity, fast curing speed, strong adhesion to PVC film, but poor water resistance, and can not be used with borax and dextrin. With a non-ionic surfactant and carboxymethyl cellulose compounded protection system, the VAE emulsion has excellent adhesion to PVC, good water resistance, can be used with borax and dextrin, but poor wet adhesion, curing speed Slow . The version numbers of domestic VAE emulsions are BJ-701, 705, 706, 707, 710, 735; CW40-700, 701, 702, 703, 704, 716, 717, 719A; JWEVA-1, 2, 3, 4, specific See Table 1 for performance. 1) Good initial tackiness and wet tack, faster curing speed, hardening of the conjunctiva at room temperature for 5 to 10 minutes, stable storage, and storage period of 1 to 2 years under normal conditions. 2) The cured film is colorless and transparent, flexible and non-brittle, with good resilience and elongation of up to 600%. 4) Good weather resistance, stable oxygen and UV light, and not easy to age. 5) Non-toxic, odorless and harmless. The content of aldehyde is less than 38Ã—10-6. It is suitable for hygiene and food use. It can be used for the production of sanitary materials such as sanitary napkins, diapers, medical fabrics, hand towels, surgical caps, etc. Discard cloth and food packaging. 6) It has good compatibility with other water-based adhesives and can be easily modified to obtain new properties. 7) Small surface tension, suitable for bonding low surface energy materials such as PE, PP, PS, etc. 8) Good adaptability, good adhesion to various materials, especially good adhesion to film products such as PVC, polyester, nylon, etc. 9) The dry film after evaporation of water can be sealed by hot-melt and the sealing temperature is 82~90Â°C. 10) It is easy to apply glue and wash, and it is safe and convenient to use. Although VAE emulsions can sometimes be used directly as adhesives, their performance is not ideal and applications are limited. If blending, cross-linking, hydrolysis, viscosity-enhancing, etc., can improve and improve performance, so that VAE emulsion adhesive can meet more needs. Adding the appropriate amount of rosin or rosin ester to the VAE emulsion can effectively increase the initial tack, and at the same time it can also increase the bonding strength. The method of adding can be that the rosin is first dissolved in toluene or other organic solvent (such as petroleum ether) , and the rosin emulsion is prepared by stirring at a high speed in the presence of a small amount of emulsifier, and then mixed with the VAE emulsion in an appropriate proportion if necessary. The rosin toluene solution can also be directly mixed with the VAE emulsion by a certain amount of mixing and emulsifying. The modified VAE emulsion adhesive obtained is particularly effective for the bonding and compounding of the PVC film with the artificial board or the metal plate. To avoid the environmental and health hazards of toluene, benzol-free rosin emulsions can be prepared. The rosin into the reaction flask, add DBP, heated until the rosin melted, dropped under strong agitation Casein-KOH solution (drop within 30min), and then drop gelatin solution, stirring for 30min, cooling the material. The emulsion is a pale yellow viscous liquid with a solids content of 41% . 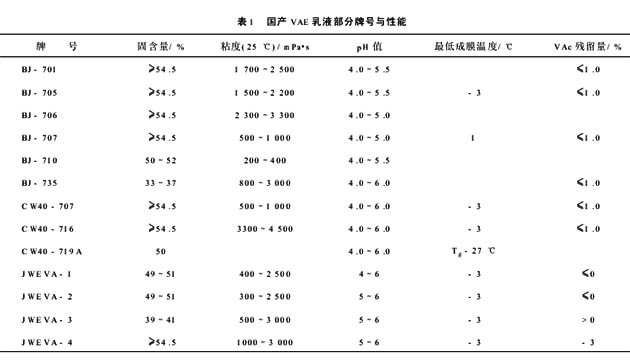 A suitable amount of toluene solution of p-tert-butyl phenol formaldehyde resin (2402 resin) is added to the VAE emulsion, and the mixture is stirred and mixed uniformly to form a modified VAE emulsion adhesive. The adhesive strength is greatly improved, and it is very suitable for the surface-treated PE and wood board. Bonding. If the rosin toluene solution and the terpene resin toluene solution are added to the VAE emulsion at the same time, there is a synergistic reinforcing effect, and the peel strength is significantly higher than when using a certain resin alone, for example, 3% rosin toluene solution and 7% terpene resin toluene. When the solution is added to the VAE at the same time, the peel strength of the PVC composite film is the highest. 1) Adding toluene solution of TDI or DBP solution of PAPI to VAE emulsion can greatly improve the water resistance and adhesive strength, and the adhesive wood board blisters can not be opened for 4 days. 2) VAE emulsions are hydrolyzed in the presence of a small amount of NaOH solution and methanol at 50Â°C, and strongly polar hydroxyl groups are produced both on the surface and inside the adhesive . A VAE solution of 8% TDI (toluene solution) and an appropriate amount of dibutyl tin dilaurate catalyst were added to obtain a cross-linked VAE emulsion, and the water resistance was greatly improved. 3) VAE/BA-GMA compound emulsion obtained by emulsion copolymerization of VAE emulsion as polymer seed and butyl acrylate and glycidyl methacrylate monomers in the presence of an initiator at 72Â°C/(2ï½ž3)h . The water resistance was improved, and after heat treatment, the water absorption was 5.4%. EISHO is committed to providing differen types of wooden hanger for pant,trouser,skirts and other bottom clothings. We have not only the types of wooden Pants Hangers designed for the close shops which required the fashion sense, but also the hangers in line with public demands. Every year, our designers will seriously study the current or next years trendy colors or trend's rule& elements, information and story inspirations home and abroad, and try to let our products, clothes hangers or storage items , keep in pace with the trend and meet with the consumer demands. Therefore, we welcome any OEM/ODM/OBM orders. All the Wooden Pants And Skirt Hangers are made from eco-friendly natural wood. There are maple, lotus, white oak, beech, cedar, rubber wood, manchurian ash available for our customers. And these options woods are often used in the Wooden Hangers , expecially the maple and lotus. Wooden Pants And Skirt Hangers are featured by their clips, clamps, and hooks, creating the special structure for the bottom items. As a professional hangers manufacturer, optional clips, clamps, and hooks are ready for our customers all the time. The strong, cleverly constructed hangers are made from the finest hardwood, featuring internal precision grooved slats to support heavy garments. These space-saving hangers are made with a double coating of lacquer to prevent splintering and a polished steel swivel hook. These clamp hangers will last you for a lifetime. Some style are with rubber and metal clips which is tightly hold items in place and keep them neat and ready for the next wear.